Dancing Stage EuroMIX is the 2nd release of the Dancing Stage series, the European version of Dance Dance Revolution series of music video games by Konami. The core gameplay of Euromix is the same as the previous Dancing Stage games. Euromix featured a brand new scoring system, instead of being heavily combo-based like the last two mixes, combos are of virtually no importance. The maximum score for each song is 10,000,000 (all Perfects). Perfects are worth twice as many points as Greats, and steps toward the end are worth progressively higher points than steps toward the beginning. In nonstop mode, a 2x, 3x and 4x multiplier apply to the 2nd, 3rd and 4th songs respectively, making a perfect nonstop worth 100,000,000 points. 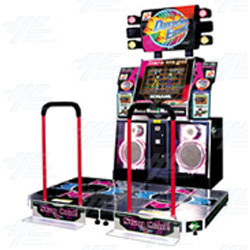 Konami released an upgrade to the Dancing Stage EuroMIX arcade cabinet known as the "Internet Ranking" version, though the name is slightly ambiguous since the machine itself does not possess the ability to connect to the internet. An interesting feature of this machine is that it contained 6 more songs than the original arcade version, as advertised by a sticker on the arcade machine's marquee. The 6 additional songs were all production's by Konami's own music composers. The Internet Ranking version of the game added an extra option to the song selection wheel which had similar functionality to the built-in nonstop mode, except the player must play a selection of songs which have already been chosen. The selection of songs on an Internet Ranking machine changes depending on the current month. Upon completing an Internet Ranking nonstop course, the machine would display the player's final score along with a code consisting of numbers and letters, which could be submitted to Konami's website as part of a Europe-wide ranking chart. The overall highest ranking players were awarded prizes by Konami for their achievements. Dancing Stage EuroMIX is the 2nd release of the Dancing Stage series, the European version of Dance Dance Revolution series of music video games by Konami. The core gameplay of Euromix is the same as the previous Dancing Stage games. Euromix featured a brand new scoring system, instead of being heavily combo-based like the last two mixes, combos are of virtually no importance. The maximum score for each song is 10,000,000 (all Perfects). Perfects are worth twice as many points as Greats, and steps toward the end are worth progressively higher points than steps toward the beginning. In nonstop mode, a 2x, 3x and 4x multiplier apply to the 2nd, 3rd and 4th songs respectively, making a perfect nonstop worth 100,000,000 points. Konami released an upgrade to the Dancing Stage EuroMIX arcade cabinet known as the "Internet Ranking" version, though the name is slightly ambiguous since the machine itself does not possess the ability to connect to the internet. An interesting feature of this machine is that it contained 6 more songs than the original arcade version, as advertised by a sticker on the arcade machine's marquee. The 6 additional songs were all production's by Konami's own music composers. The Internet Ranking version of the game added an extra option to the song selection wheel which had similar functionality to the built-in nonstop mode, except the player must play a selection of songs which have already been chosen. The selection of songs on an Internet Ranking machine changes depending on the current month. Upon completing an Internet Ranking nonstop course, the machine would display the player's final score along with a code consisting of numbers and letters, which could be submitted to Konami's website as part of a Europe-wide ranking chart. The overall highest ranking players were awarded prizes by Konami for their achievements.